Healing Solutions offers a state of the art Low Air Loss Bed which addresses one of the many problems associated with specialty products? training and education. 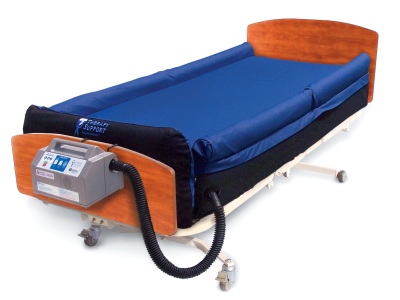 Our iQ Medical Low Air Loss System features Instant In-service®. Instant In-service® is a built-in audio component that provides users with immediate instruction on the proper use of the iQ Medical System. Instant In-Service® provides 24/7 audio tutorial instructions for existing or new caregivers and is the ideal aid in assisting distributors with the initial education of the system. By simply pressing a button on the control unit, caregivers are guided through a straight forward, easy to understand set of audio instructions that will help insure proper usage, resulting in optimal patient care. This feature is extremely beneficial in minimizing risk and liability.